I’ve always loved doing laundry. The fresh smell of clean clothes, the warmth that comes from a “just-out-of-the-dryer” blanket, and the methodical act of folding clothes. What I don’t love so much is how when I accidentally leave clothes in the dryer, everything gets all wrinkled and then there’s also the dreaded “Dry Clean Only” label. Blech. Fortunately, there are products available that can address all of these issues in an effective and fresh smelling manner. Let’s tackle the issue of Dry Clean Only clothing. It seems like more and more stores are putting out “dry clean only” clothing, as if to say that these are quality items (even if they aren’t.) I have difficultly justifying a $4.00 dry clean for a sweater that has only been worn once. Enter Dryel. Dryel allows you to dry clean your clothes in the comfort of your own home with just your dryer. Simply throw the Dryel sheet into the Dryel bag along with 3-4 clothing items, dry, then in 20-30 minutes you have fresh smelling, “dry cleaned” clothes! I’ve saved hundreds of dollars on dry cleaning costs by using Dryel. 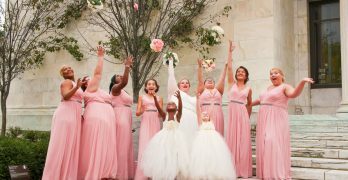 They also have a 3-in-1 touch-up spray to give once worn clothes a little bit of freshness, as well as an on the go stain remover – something every woman should have in her purse. 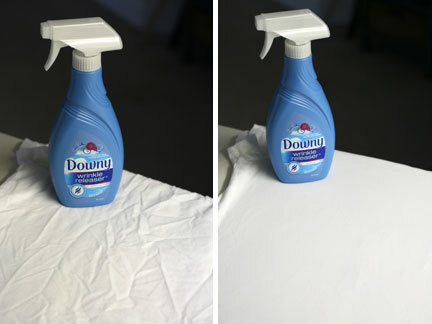 By the way, the Downy Wrinkle Releaser also has a great scent and helps your clothes smell uber fresh. If you want that extra level of crispness for dress shirts or slacks, then you’ll want to use the bounce Ironing Spray. 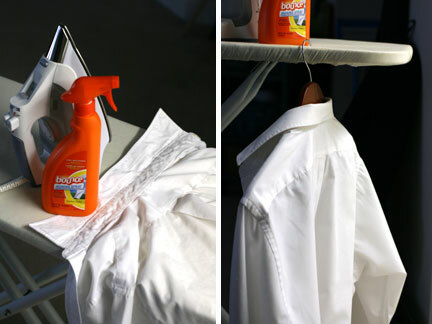 As you are ironing, just spray the Ironing Spray evenly onto the clothing item and iron. Ultimately, the bounce Ironing Spray helps give the shirt a “just starched” look but it isn’t stiff or flakey. A few other products to keep in your arsenal include the febreze Laundry Odor Eliminator, Dreft Laundry Stain Remover, and Dreft Gentle Clean Multi Surface. The febreze Laundry Odor Eliminator is perfect for getting rid of those extra strong funks that can sometimes linger in “very worn” cloths. (As in, that shirt that hubs did yard work in or clothes that accidentally got left in the dryer and got all mildewy.) Just add the odor eliminator into the wash and it will replace the funk with a great fresh smell. 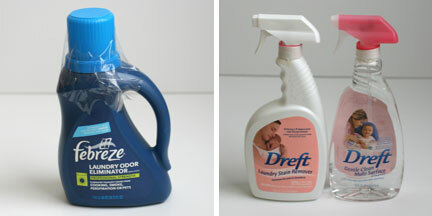 If you have young children around the home, you can use Dreft Laundry Stain Remover and Dreft Gentle Clean Multi Surface to keep the home clean and safe for little ones. The multi surface cleaner effectively cleans counter tops, glass, and other surface using ingredients derived from natural sources. 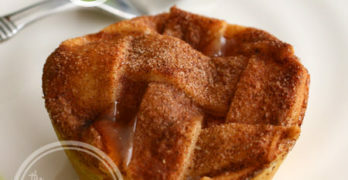 It also leaves a great “baby fresh” scent. The Laundry Stain Remover is specially forumatled to safely address the stains that inevitably come with infants and young children while still being safe to use on fabrics. For more information about any of these products or to find additional products to help keep your home clean, visit www.onecareco.com. One winner will receive a clothing care package which includes: a Dryel starter kit, refill and stain pen, Downy Wrinkle Releaser, Bounce Ironing Spray, Febreze Laundry Odor Eliminator and a selection of Tide travel products and lint rollers. Febreze Laundry Odor Eliminator is my favorite! Dryel would have to be my favorite. I just ruined a beautiful sweater the other day that, had I used Dryel, would still be in perfect shape. Febreze Laundry Odor Eliminator is my favorite. I would be most excited about the Downy wrinkle release! I like the pet care products, especially the Gentle Care Puppy shampoo. My favorite is the Evercare Pet Hair Sweeper, but there are a lot more I like! I like the Bounce Lint Roller because it works well on clothes and on blankets or comforters that get crumbs from the kids (or maybe me too). My favorite product is Purina Deep Deodorizing Dog Shampoo! 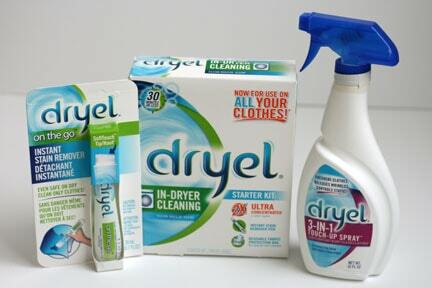 I like the Dryel dry cleaning kit best! Definitely the Purina Grooming Tools! Having pets, I could sure use the Evercare Lint Rollers. I love the Evercare giant lint rollers. Very awesome! The entire Tide and Downy lines! Our preferred brands for anything laundry related! we love the wrinkle release spray! Ironing is the bane of my existence. My favorite product by far is the Downy Wrinkle Release. I haven’t used an iron in over a year, thanks to this product. Dryel is my favorite product for keeping my jeans dark! The Bounce Lint Roller because I have lots of pets that shed on my clothes. My favorite is downy. It really makes the clothes smell so good. My favorite is the Dryel cleaning cloths. Febreeze laundry odor eliminator is my favorite. Downy Wrinkle release is a great product to own. My favorite is Dryel 3 in 1 Touch Up Spray. Id like the gentle care puppy shampoo.Thanks for the chance. My favorite product is the Dryel On The Go stain pen. Bounce® 15-Minute Dry Cleaner, great for emergencies. The on the go stain pen would be great. I could really use the “Tide Odor Eliminating Pop-Up Hamper”. My favorite is Dryel, because i can do my own dry cleaning! It saves money, and i love that. My favorite is the Giant Lint Roller. Have to have it when you wear dark colors. My favorite is the Febreeze Laundry Odor Eliminator. I like the Evercare Lint Rollers! I love the Dreft Laundry Stain Remover. I love any of their pet care products! With 3 dogs and 5 guinea pigs, our house could use any of them! I love the Dreft! I have used it for years even though my kids aren’t babies anymore I continue to use it. I like the Dryel On The Go Stain Pen. dreft! I love it. I still use it to keep my towels and sheets soft. the febreze laundry odor release spray is a lifesaver! My favorite is the Evercare Lint Rollers. I love the lint rollers. Thanks. My favorite is the Dryel starter kit. I like the bounce 15 minute dry cleaner. my favorite product is Febreze Laundry Odor Eliminator. my daughter is a waitress and you uniform smells just awful but this really helps tame the odor. Tide Bra Bag would be great cause my bras are always getting messed up in the wash. I would love to try the Purina Deep Deodorizing Dog Shampoo! I’d try the Dryel on the go Stain Pen. I like the scents and softness that Downy creates. On The Go Stain Pen. The on the go stain pen. Evercare Fabric Shaver is my favorite! I use the Evercare Lint Rollers all the time! With 2 cats, there’s hair on everything. I want the Dryel On the Go Stain Pen! The Tide Bra Bag. I really need one of those. I think the Tide bra bag would be awesome!! I hate hand washing! I like the Evercare Fabric Shaver. The giant lint rollers – 1 dog and 3 cats mean we always need these. Dryel on the go stain pen. My favorite is the Elemental Odor Absorbing Gel Fragrance Jars. i love the Dryel® 3-IN-1 Touch-Up Spray! I would like to try the elemental soy candles. My favorite product is Purina Stain and Odor Multi-Surface Spray. My favorite product is the Purina Moisturizing Oatmeal Shampoo for dogs. I love the Tide Bra Bag from the website, I might have to get it! The on the go stain pen, I spill coffee on my clothes in the morning 3 out of 5!! Febreeze is my favorite product !! Could not live without the lint rollers! My favorite is the elemental soy candle. my favorite product from oneCAREco is Febreze Laundry Odor Eliminator. don’t know what my favorite is but i wanna dry the deodorizing dog shampoo. The Evercare lint roller, I have 4 cats so needless to say need to use the roller everyday! My fav is the original febreeze spray..I love this stuff & am addicted to it! I spray everything – including my HAIR! Puppy shampoo. I am a sucker for cute packaging! I like the Giant Lint Roller. My favorite item is the Clorox Glassware brush. I like the Purina Shampoo!